Air & Hydraulic Supplies Inc. 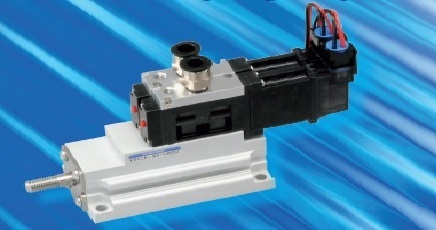 Designed for high speed sorting applications that require more than a “bullet” of air. With a maximum operation frequency of 100 cycles per second and response time as quick as 5ms or less. Innovative Solutions dedicated to the Life Science market. Introducing serial transmission compatible manifold in F10 and F15 series for our lineup of EtherCAT compliant products. Prevents condensation from developing inside the piping to pneumatic grippers and small cylinders! The revolutionary water separator system now has ‘Imperial’ and ‘G’ Threads! Koganei iB-Cyclone uses a high-speed cyclonic system to maintain water separation rates even if flow is increased over 2,000 l/min. Cylinders are guaranteed to ship in 2 days. All cylinders are 100% tested. No extra charges apply to this program. Cylinder switches and mounting accessories are in stock ready to ship with your cylinders. Starcyl is pleased to announce the new 955C Brik continuous position feedback sensor, available with your choice of Analog, Digital or Quadrature outputs. Please note that a magnet is required to detect the positioning of the cylinder, at all times. This new transducer can be purchased as a complete unit, (Cylinder & 955C Brik) or purchased separately to retro-fit existing units in the field. The range is supplied with a host of features, including the intelligent electronic processor to manage the cycles of the dryer’s function and the condensate level via computer interface. The dryer also features an XA grade filter housing and electronic drain as standard, a choice of pressure dew points to meet the highest standards as specified in ISO 8573:1 and can be installed anywhere in the world with its ability to recognize and operate with many different voltages, making PROSFD a great product for the OEM customer too. Welcome to Air & Hydraulic Supplies Inc., your source and supply of Industrial Automation Devices and motion control components related in the field of Pneumatics, Hydraulics, and Vacuum applications. Our products are used throughout the globe, within various markets from industrial to medical. We provide solutions for companies which produce products such as; electronics, automotive, pulp & paper, food & beverage, packaging, textiles, transportation and much more. We invite you to explore all we have to offer. Copyright © 2011 Air & Hydraulic Supplies Inc. All rights reserved. Powerd by Trew Knowledge.